Lord Hope of Craighead delivered the annual lecture at the Society’s 78th AGM, held in the Faculty of Advocates’ MacKenzie Building in Edinburgh on Saturday 16 November 2013. His topic was “Life on the Law Lords’ Corridor: The Last 40 Years”. 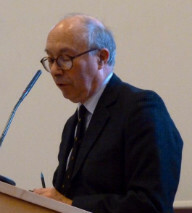 The Society’s outgoing President, Lord Hope retired in June 2013 as Deputy President of the UK Supreme Court. In 1989 he was appointed to the Bench direct from the Bar as Lord Justice General of Scotland and Lord President of the Court of Session. He was appointed Lord of Appeal in Ordinary in 1996 and joined the Supreme Court on its inception in 2009. Addressing a packed assembly of members of the Society and their guests in the Faculty of Advocates’ MacKenzie Building in Edinburgh, Lord Hope gave a fascinating insight into the workings of the House of Lords and the Supreme Court, drawing on his personal experience gleaned over nearly fifty years at the Bar and on the Bench and quoting extensively from his own diaries maintained over that period. He looked at where and how the Law Lords worked in the House of Lords during the period of 40 years before its appellate jurisdiction was transferred to the UK Supreme Court and compared this with the way things are done now in the Supreme Court. Lord Hope's lecture is available as a podcast from our new podcasts page. This Podcast is hosted at SoundCloud which has minimum browser system requirements. If you are having problems accessing it, please see the SoundCloud help page for information about compatible browsers.